Hi, Mary-Ann here! 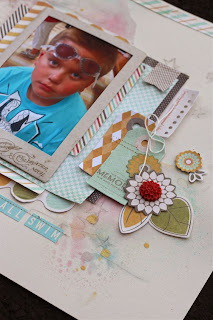 With watercolor being an up and coming challenge here at Eclectic Paperie, I decided I'd try my hand at watercoloring on this swimming layout. Fitting don't you think? WATERcolor with swimming!! Anyway, I also tried a new technique. I laid out my non-stick craft sheet and lightly sprayed color mists directly on the sheet and then diluted this by spray by spraying water directly on top. This helped thin my colors. It is hard to see in this photo but look closely! I then turned my paper face down onto the wet puddles of spray. When I lifted and turned my paper over, I could see where the colors mixed on my paper. 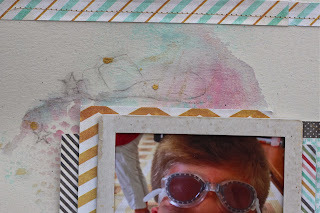 Once I decided where my photo and papers were going to be, I got out my Tim Holtz Stars Layering Stencil and with a gray watercolor pencil, I traced where I wanted random stars. With a blender pen or water brush, I lightly went over the pencil marks to make them blend like watercolor. See the stars? I then took the same colored pencil and drew light lines and lightened those with the same blender pen. Layered on my tags, ephemera embellishments and resin flowers. This Fancy Pants line, Happy Go Lucky, was PERFECT for the colors in my photo. I must say, I have tons of product left that would create a completely different style layout. After this layout was complete I trickled droplets of gold spray in various places and used gold thread to sew. This time, the sewing helped keep my tile and small embellishments in place. You can find the items from this layout here in the shop or on the links below. Love this!! Those Fancy Pants embellies and mini tags are wonderful and I love how your mixing up color on your craft sheet and grabbing a stencil...just perfect! What a gorgeous, watercolored layout! I love how you used the stencil for the stars! Mary Ann, LOVE how use used water coloring for your water layout! Brilliant! LOVE this technique, love the stars! FAB layout! This is adorable and those tags are great! !